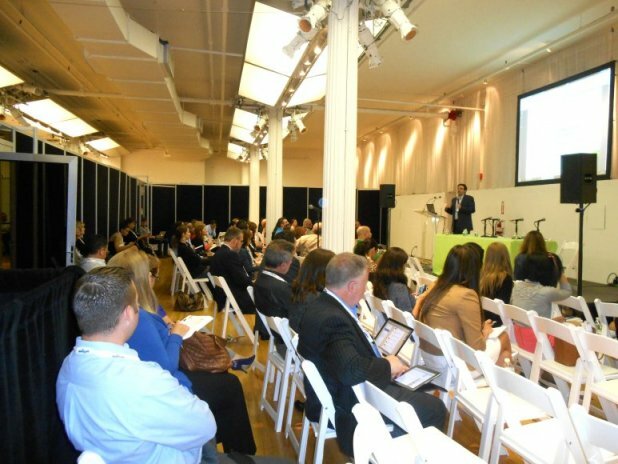 Professionals in all walks of digital and integrated marketing, publishing, and advertising gathered at Metropolitan Pavilion on West 18th Street in NYC for an information-packed "DAY 1" of Integrated Marketing Week 2013 Conference . This exciting event got quickly off to a magnificent start with Seth Godin, you know that marketing extraordinaire, squidoo.com founder and author of 17 worldwide-bestselling books. Godin's keynote addressed the importance of being noticed especially in times of volatile economic market conditions. 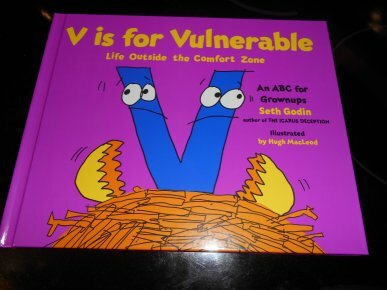 Godin also had his latest book "V is for Vulnerable – Life Outside the Comfort Zone" and was available after the keynote for autographs.” Godin has been known as the stand out marketer ever since his “Purple Cow” book was published a decade ago (May 2003); I still have my autographed copy. There was plenty of networking opportunities in-between choices of 3 out of the 18 session offerings for Day 1. (Day 2 will also feature 18 sessions and Day 3 will have about a dozen sessions). Integrated marketing is a very broad but integral ingredient for marketers in all areas particularly retail, ecommerce, and publishing. There was a wealth of strategic marketing topics covered today including the importance of shifting from informing to engaging and from business intelligence to email intelligence. This holds particularly true with the multi-platforms and channels developed and implemented on a constant basis. Did you know that email intelligence platforms can find out many things including why an email campaign is failing? And also determine when emails are landing in spam folders? The “Email is getting Smarter, Are You?” session with Tami Forman, Return Path’s Senior Director, Global Corporate Communications, shared insights on that and much more on why email intelligence is crucial to marketing success today. Integrated Marketing Week "DAY 1" intrigued and inspired many top marketers and gave me the opportunity to meet and interview three stellar integrated marketeering professionals: Lynne Laube, President and Co-Founder of Cardlytics; Stefan Tornquist, Vice President of Research, North America, Econsultancy; and Shane Marcus, Business Development Manager at Rapp. 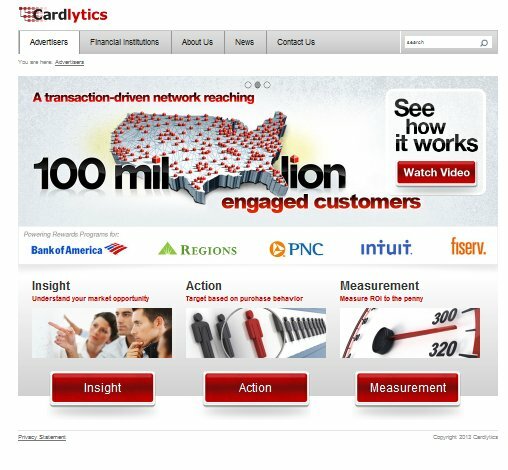 Laube described her innovative product, Cardlytics, a real-time marketing analytics platform for consumer purchase behavior for 70% of U.S. households which answers the question many marketers need - “Where do your customers buy…when they’re not buying from you?” Their product creates a seamless, consumer experience, helps retailers deliver targeted messages and offers to the right people based on where and how they are spending money. Tornquist, Econsultancy VP, described key challenges to integration and shared findings from the “2013 Integrated Marketing Week Survey” which addressed questions and answers from hundreds of marketing practitioners insights. The main focus is research around what is happening in digital marketing. Tornquist also discussed “A Manifesto for Modern Marketing,” virtually a 12 point guideline to what is modern marketing. "One of the interesting findings is that when comparing sophisticated with unsophisticated marketers, findings were that the true essence of modern marketing was exactly what the sophisticated marketers found to be their top challenging element -- creativity over strategy and technology," explained Tornquist. 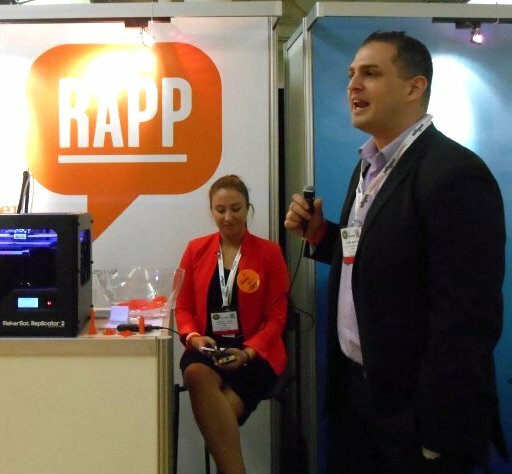 Shane Marcus, Business Development Manager at Rapp, described Rapp as the customer experience agency. Marcus also described how his company has evolved from its direct marketing roots 50 years ago in 30 countries and creates customer experiences by harnessing big data that are inspired by culture and enabled by technology -- bringing the ultimate customer experiences for their clients -- Fortune 500 and 1000 companies. The "See What You Missed Montage" video with amazing takeaways is here in record-breaking time. Enjoy, share, and please bookmark this blog and visit frequently. Thanks! 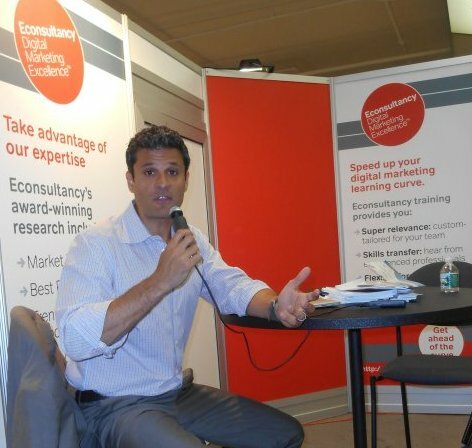 Photos, audio and video recordings were from interviews by Gloria Buono-Daly, Founder, AllThingsDigitalMarketing.com. Any other photos and materials not by AllThingsDigitalMarketing, will be credited as required. One to One with Gloria" interviews are by AllThingsDigitalMarketing.com. This video was produced using video, photos and audio recordings from interviews by Gloria Buono-Daly during the event. Interested in knowing how this video was done? Maria Benevenga, Senior Design Specialist and Creative Extraordinaire created the video using Adobe FinalCut Pro software and/or Adobe Premiere. To view on YouTube http://youtu.be/aGfZJM3eKHI . 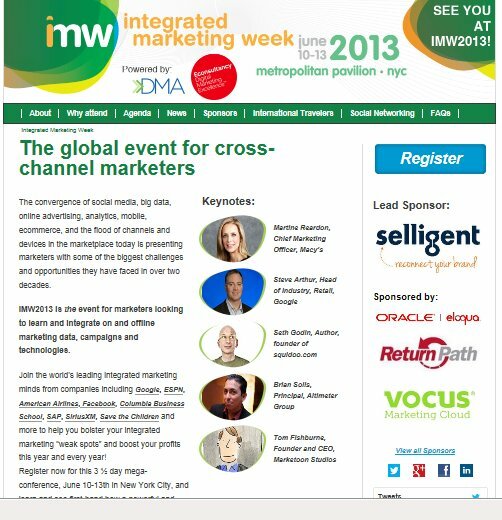 Integrated Marketing Week is the premier event for marketers who are looking to effectively deliver a unified customer message across ALL marketing channels, while also optimizing their marketing budget.